38 Responses to "BODYPUMP 81 tracklist"
Great Glen, thanks a lot. Most of those songs are unfamiliar so I’m curious to start listening! Cheers – hope it’s right! It IS an epic shoulder track!!! No worries Olle – the one above is correct so good to have it sorted! Thanks Oscar – yep I updated that a couple hours ago. Same track but yes different title. What a great playlist! Thanks for posting! Looks good Glen, thanks mate! Absolutely love this release. The back- and shouldertrack are my favourites. on your side, Gaga “style” is better for my workout. I sometimes find the Rock sound aggravating while I’m focused and pumping but that’s just me. But this playlist appears to be a good attempt to please everyone – good job Glen! Does Australia get the alternative tracks? I noticed on your blog with the last realease (or maybe the release before that one) that there were alternative tracks but no instructor I’ve had has ever chosen to play them…. are we excluded now because of the stupid PPCA. Yes, we get the alternative tracks as well – PPCA-free. I usually play them when we start back into the mixing period. If your instructors aren’t playing them ever, make a request for them! Ok now that Raver’s Fantasy has finally made it into a Les Mills program (Wish it were Attack or Combat) I have something to be excited about. Thankfully this release is gaga free. Thanks for your info and insight, Reamary. I’ll give it a try. It probably has something to do with the lactic acid just as you mentioned. Here is the Spotify playlist! Enjoy! WTF!!! Nothing from DJ Ötzi (Sweet Caroline), Scooter, Gn’R and the Scorpions!!! The music is what makes you “pumped” for pump, and I have to say that the music of late had made me want to skip the classes and do my own classes instead. I have been doing pump since BP19 and I am sad to say that the last 10-15 releases bar a few good tunes have made me not want to attend anymore AND I love music! Completely agree with you Eveline! Whenever our instructors mix it up, the older ones always get the energy going and the thumbs up from the class. I am bored to tears with the ‘bad karaoke’ style mixes (eg gaga song from bp 80). It does absolutely nothing for motivation and is simply BORING. I also have a problem with the tendency for bp to repeat the same section of moves 3 times – it is lazy choreograhy if you ask me. It was so much more challenging in the old days. Don’t get me wrong, I truly love BP and it got me fit, but most of the people in our classes are unhappy with the latest releases. We always go back to the staggered lunges, Robbie Williams biceps, etc etc. Not only are they harder to do, but they are just better music with so much more motivation. One of our instructors has been doing some Body-Rip lately – ever tried that? It is awesome – faster bp moves, WAY better music. And at the end of it, we are all sweating and out of breath but smiling. I don’t see many people enjoying bp lately – we seem to be simply enduring it. Wow great, thanks for the list! I love the chesttrack!! !I want to dance to it!! !Will this one also be in Bodyjam?!? Just did this release and its hard, but great songs imo. Yay to track 3, and track 8 and 9. I liked Gaga’s Telephone, edgy; I *hate Edge of Glory – it’s corny and lame .. I was lucky to start BP during 75, I loved almost all its tracks .. can’t wait til 81 on 16 April (Athy, Ireland!) … am just about getting the hang of lunges in 80 but loved Rihanna’s Only Girl In The World for this, the only one where I could actually complete the lunge track!! Back Track and Shoulder Track = Thumbs Up! I’ve been doing BodyPump for over a year now. No offense I really don’t like the music although it’s motivating. Everything is so challenging. That has’ nt stopped me though. LOVE IT. Songs move me. It’s clear it’s jamming for some and a dud for others. What’cha gonna do? Hi, I’ve been doing Body Pump and recently got back into Combat and I love it! I am not too keen on the recent music release of body pump but I absolutely love the new Combat music! I really look forward to going to classes. 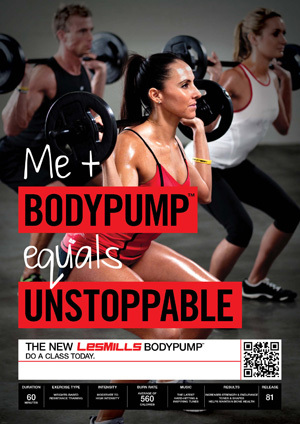 Also, I think body pump 81 music is rockin’ hot! love blood pumping and mr saxobeat! Keep the music coming!!! !